MYOB has added a breakthrough feature with MYOB Advisor, an algorithm-driven feature that automatically adds explanations and suggestions to financial reports. Included in MYOB AccountRight Live and MYOB Essentials, MYOB Adviser generates a 15-page, monthly management report in seconds. 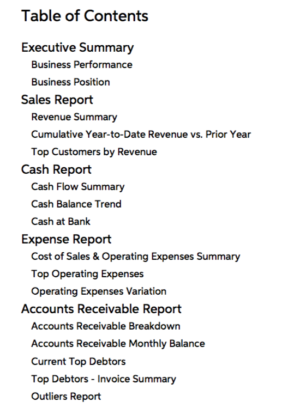 It includes sections on sales, revenue (year-to-date and cumulative), top customers by revenue, cashflow summary and at bank, expense report with cost of sales and operating expenses, and accounts receivable with top debtors. The real magic is in the use of algorithms to insert plain-English explanations in each section of the report. A business owner can pick up the report and understand instantly how each part of the business is performing. MYOB Adviser inserts two types of advice. The first is the explanation, in black font, describing the story behind the numbers in each section. The app uses an algorithm to analyse the numbers in the report and generates an appropriate explanation from its internal “natural language” library. An accountant or bookkeeper can manually edit both boxes to include their own observations or delete the auto-generated text. Examples of the two types of advice generated by MYOB Advisor. 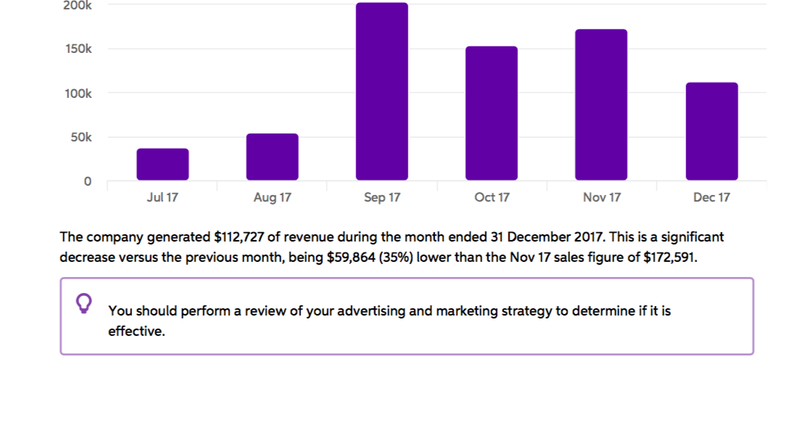 If you would like a sample report from MYOB Advisor that shows the natural-language algorithm at work please leave a comment below. Update: MYOB will send a better version of the report by Friday. So leave a comment and I’ll send it to you then. MYOB Advisor is a key element of MYOB’s “connected practice” concept. By turning data into written sentences that simply explain business performance, accountants and bookkeepers can use the reports as a prompt to speak with clients. The management report becomes a reason to meet with the client once a month to review progress, spot issues and adjust forecasts. MYOB Advisor is in a pilot program with general release set for mid-2018. Seidel said the reporting tool could engage staff who are tired of compliance work. Very interested. Could you send copy of report please. I would love a copy of the report once the downloader is up and working again. Very exciting direction, and great to see this innovation coming from MYOB. If there is good use of AI behind this, we should see the level and sophistication of suggestions improving as the software matures and gets more ‘experienced’. Ideally, the software would track whether people accept the suggestion or change it in order to improve its suggestions. Easy to follow and ticks off all the main requirements. It kind of looks like a Fathom HQ report. Really valuable for some future planning for an SME. However, it does lack some essentials. But that might be because of the demo data used. These are key items for cash flow planning for mums and dads type businesses…….”micro businesses”……they would want that info on cash outflows way before they want to know about the other KPIs. Xero does not have this reporting capability (In Xero core) but that is why the HQ reporting apps (and other reporting apps) exist. Some of those apps also have “scenario planning”. EG – how much profit will I get if I add 3 more salespeople, how much revenue would I get if I add 6 more tables to my cafe, should I buy that shop?……………..all key strategic decisions that need a professional advisor. Not sure if MYOB Advisor does / will do scenarios? The other thing is, anyone can pull a report like this together. The question is, how long did it take and how much editing was needed to get it into the relevant format. Items such as chart of account mapping, report fields, customer fields and workflows are essential for optimal automation. So I would love to see a video demo of the report production process. That is where the value for the accountant is. Would also love a copy of the report!